Today on Love, Maggie, we’ve compiled a handy wedding dress fabric guide. Shopping for a wedding dress is one of the most anticipated and exciting steps for a bride. However, with so many details to consider including color, cut, cost and length, approaching this decision can feel intimidating. 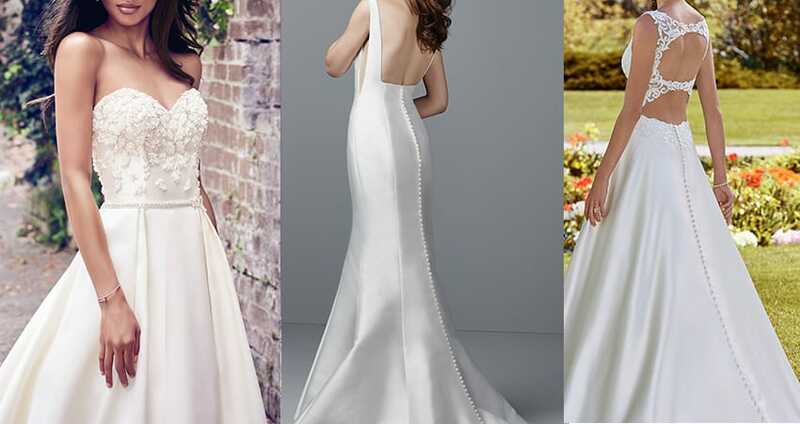 As one of the most important factors, wedding dress fabrics may seem unfamiliar and therefore overwhelming… Make your experience a little easier with our wedding dress fabric guide! Satin is a favorite go-to fabric for wedding dress designers seeking to add structure and drama to their collection. To help brides look and feel their best, our design team utilizes the rich support of satin fabrics to provide dress structure in conjunction with our incomparable Maggie fit. 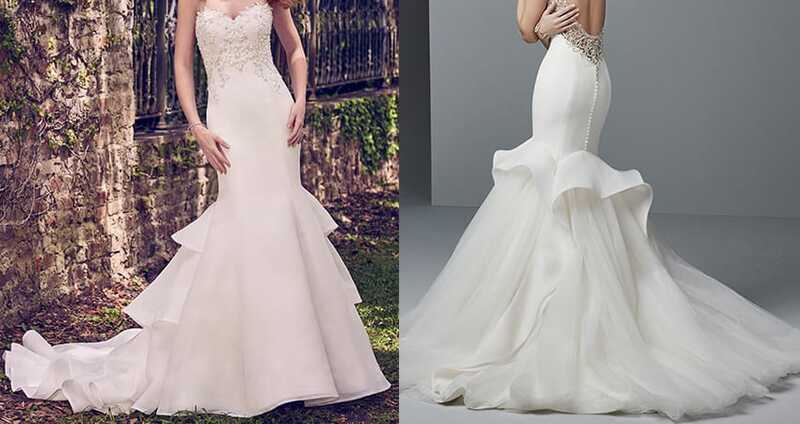 Satin’s smooth fabric makes it the perfect choice for ruched, draped, and ball gown styles. Because of its heavy material, satin is a great choice for low-temperature weddings. Choose dutchess satin for your elegant winter wedding this year! The elaborately patterned cotton lace is a fresh interpretation of classic lace fabrics. 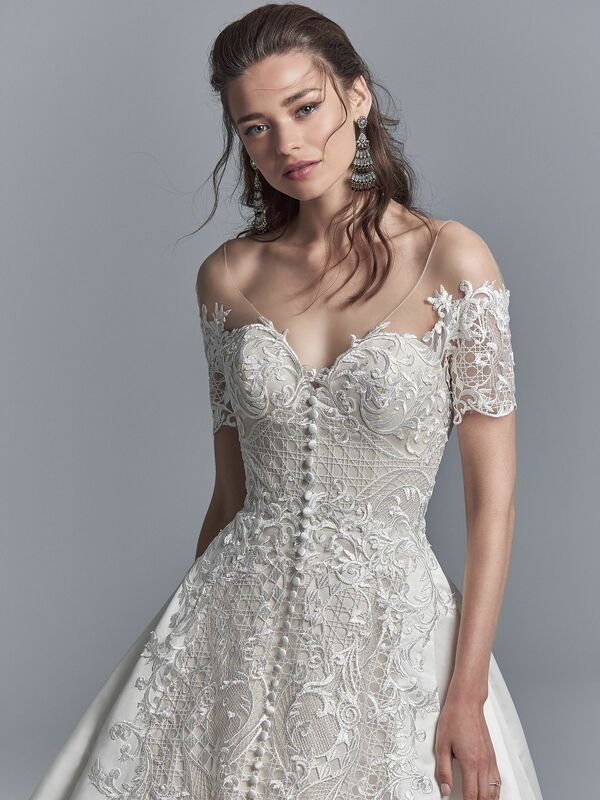 Bold lace adds texture and depth to many wedding dress styles, but we especially love it on our Presca gown because it is not overpowered by the gown’s simple silhouette. Add a twist to your classic yet modern wedding style by incorporating bold lace. Tulle is a netting made of silk and nylon. Because of its delicate and sheer nature, it’s primarily used for veils and skirts. We love the way that tulle adds drama and volume to a dress without adding bulk. Our Hazel dress makes a statement while remaining soft and feminine as delicate tulle falls effortlessly over the classic lace silhouette. 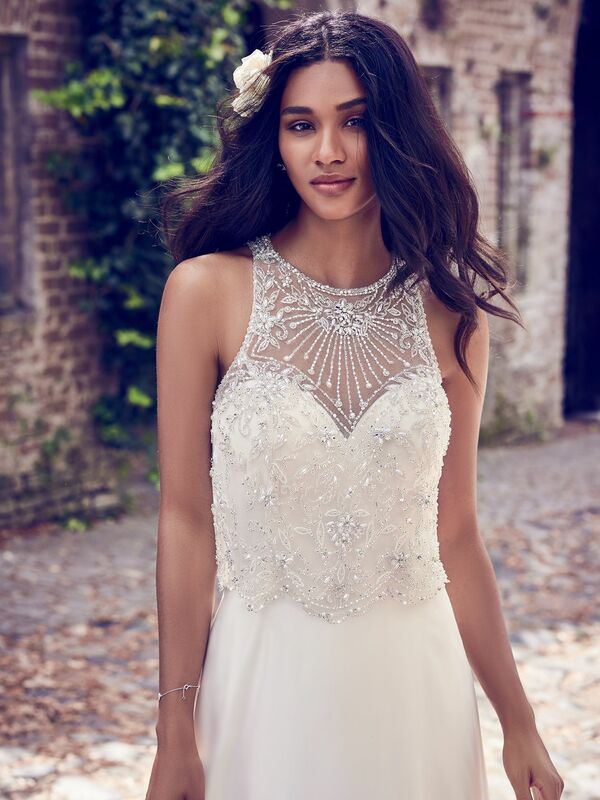 Swarovski crystals and our famous corset closure give this dress glamour and the perfect fit that will complete your dreamy wedding-day look. Organza is a sheer and lightweight fabric like chiffon, however its crisp texture allows it to hold shape. Paired with blush, a hot trend for wedding color palettes, organza fabrics create a high-fashion look. Try our Quintyn gown around the month of February for an added amount of romance and glamour. The gleaming and whimsical effect of Mikado provides lines that will lead eyes to all the right places, highlighting your best feminine features. Mccall and Cohen feature design details, like the sheer side insets and square back neckline, to flatter every body shape. 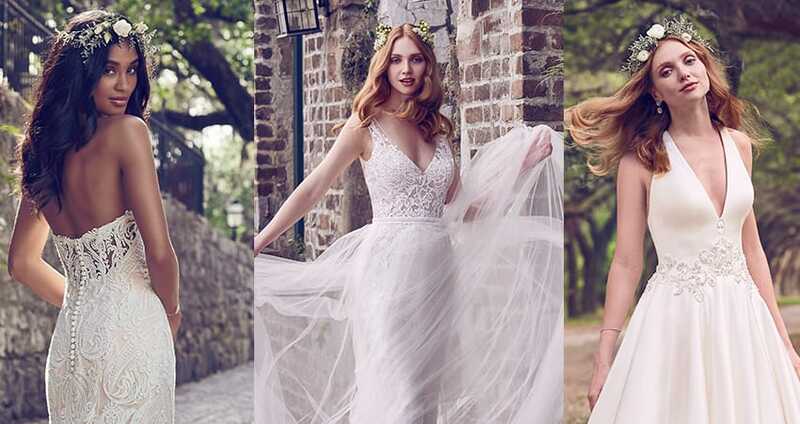 These gowns are the perfect solution for a bride dreaming of a simple and romantic feel but not willing to negotiate our incomparable Maggie fit. The soft elegance of Chiffon effortlessly flows in the wind and is light-weight, perfect for a summer garden wedding. 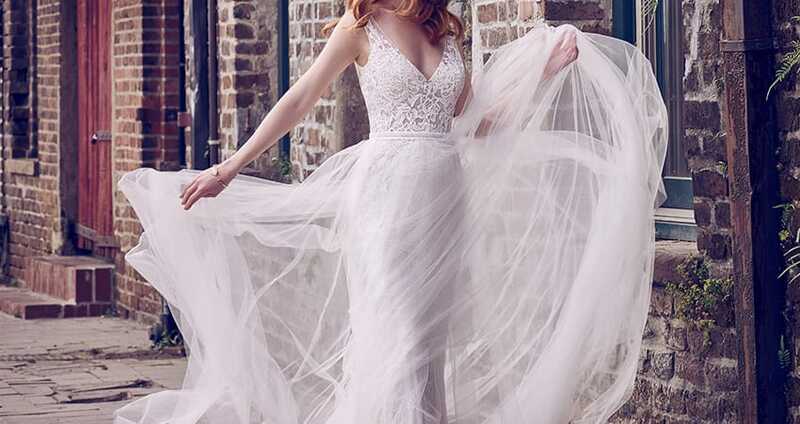 Mercy with delicate illusion sleeves and beaded lace accents glisten with each twirl so you can dance the night away.